Park View Academy, an innovative new daycare facility, has signed a lease to open its first location at Vantage, the luxury high-rise rental building in downtown Jersey City, N.J.’s Liberty Harbor North neighborhood. Slated to open in Early 2019, the new early childhood school will serve both residents of Vantage and the community-at-large, according to Fisher Development Associates, which is developing the 448-home waterfront building overlooking the Manhattan skyline, the Statue of Liberty and Liberty Harbor Marina. Park View Academy’s mission is to create a safe, educational, and friendly environment for the children under their care. They believe every child is unique and their growth depends on patience, understanding encouragement, and lots of love! Every day will bring a new and exciting challenge for your little one to experience. The center is the first collaboration between two local veterans of Hudson County child care, partners Yeon Benkovitz, owner of Lucie Goosie Toddler Enrichment in Jersey City, and Diane Branco, owner of World of Wonder daycare center (WOW) and Wowkids, LLC in Hoboken, NJ. Park View Academy will occupy approximately 4,600 square feet of ground floor retail space at Vantage. The facility will feature a large play area to strongly encourage a high level of child interaction. A nearly-completed seven-story luxury condominium building in uptown Hoboken now has a name and a launch timeline. Bijou Properties has chosen the name Candela Lofts for the striking new building and announced a June opening of sales for its 10 high-end residences. The developer has also unveiled an exterior and interior rendering of the building and launched a teaser website at www.candelalofts.com where interested buyers can register as a VIP Prospect and participate in the preview opening. Candela Lofts will be the first Passive House luxury multi-family building in New Jersey and will set a new standard for luxury and sustainable living on New Jersey’s Hudson River Gold Coast. The building has been created to achieve a quantifiable and rigorous level of energy efficiency with superinsulation and an airtight building envelope. Designed by Nastasi Architects, the contemporary building has been developed to achieve LEED Platinum certification from the U.S. Green Building Council (USGBC). Located at 1024 Adams Street, the one-of-a-kind Candela Lofts will feature a select number of two-, three- and four-bedroom homes with high ceilings, oversized windows, walk-in closets, sleek cabinetry and Miele appliances, and private outdoor space. Some homes will boast magnificent views of the New York City skyline. Additional details will be revealed on the website in the coming weeks. Hudson Place Realty will be handling sales for building. Fisher Development Associates announced today that Vantage, its new luxury rental high-rise in downtown Jersey City, N.J., has received LEED® certification from the U.S. Green Building Council (USGBC). Soho Lofts is setting the pace in Jersey City’s flourishing rental market having achieved a level of leasing velocity not seen on New Jersey’s Hudson River Gold Coast in recent memory. In fact, the industrial-inspired community recently experienced an enormous surge in activity that netted nearly 80 homes reserved in a four-week period alone — remarkable rental volume that’s typically only witnessed during a grand opening phase, reports its developer Manhattan Building Company. The impressive rush in interest has propelled the collection of 377 loft-style apartments towards the notable mark of almost 60% leased in the first four months of availability. Manhattan Building Company introduced Soho Lofts to the public in mid-November, delivering luxury apartments with some of the largest floorplans in Hudson County and an exciting mix of resort-inspired indoor and outdoor amenities. Soho Lofts is the next chapter in the incredible success story being written within the SoHo West Community (south of Hoboken, west of New York City), a new neighborhood concept that’s brought upscale rental buildings and a diverse mix of shops, services and conveniences to Jersey City’s Hoboken border. There’s little question Jersey City has gained a strong foothold in New York City’s housing market, capturing the attention of many Manhattan and Brooklyn residents with its easy access to work centers, upscale, fully-amenitized residential buildings and the exact type of vibrant and thriving downtown environment urban living enthusiasts seek. For long-time Manhattan residents Jacqueline Troccoli and Alberto Pomello, the buzz emanating from this trendy New Jersey Hudson River Gold Coast City caught their ear in 2016, prompting the couple to investigate its rental opportunities and lifestyle. Jaqueline and Alberto would end up renting a home that summer at Ohm in Hudson Yards. 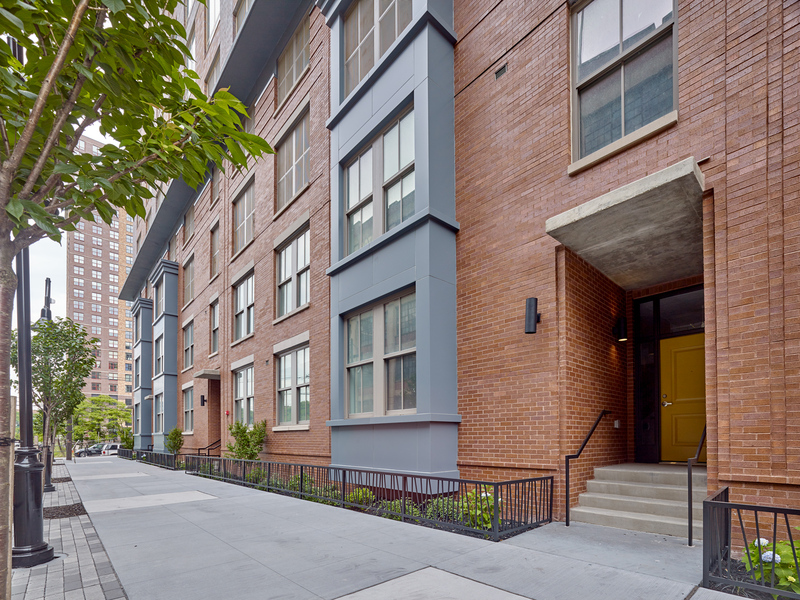 Thirteen months later, however, they came to a firm decision it was time to escape the crowds and congestion of Manhattan and make the move to Jersey City where they could find a more expansive apartment at more attractive pricing. Developer Manhattan Building Company has officially unveiled a package of forward-thinking, world-class amenities at Soho Lofts, a new collection of 377 apartment homes in Jersey City’s fast evolving SoHo West (South of Hoboken, West of New York City) Community. Designed to provide renters a socially-infused urban lifestyle, the professionally-decorated communal spaces radiate a chic and trendy feel that’s on par with fashionable resort destinations and designer five-star hotels. Found within the industrial-inspired community are contemporary lounges, including a retro arcade, gaming areas and tech lounge, fully-equipped demonstration kitchen and private party room, surround sound media room and private conference rooms, children’s playroom, dog grooming suites, state-of-the-art fitness center with ten-person sauna and indoor/outdoor yoga room. Vantage, the upscale 45-story rental building in Jersey City’s Liberty Harbor North, recorded impressive rental velocity in 2017 and has entered the New Year having surpassed an important leasing milestone. Fisher Development Associates recently announced more than 50% of the 448 luxury apartment homes at the Hudson River waterfront building have been leased. The developer, along with exclusive marketing and leasing agent, The Marketing Directors, achieved the impressive mark in the first five months of availability. The notable achievements do not end there. More than 300 residents have now moved into Vantage, transitioning the building into a vibrant and lively residential address and cementing its status as one of the hottest new rental buildings along the New Jersey Gold Coast. By Joshua Burd – Kushner Real Estate Group is set to begin construction on the second of three residential towers at its Journal Squared project in Jersey City, following the success of a first phase that has leased nearly all of its 538 apartments in less than a year.